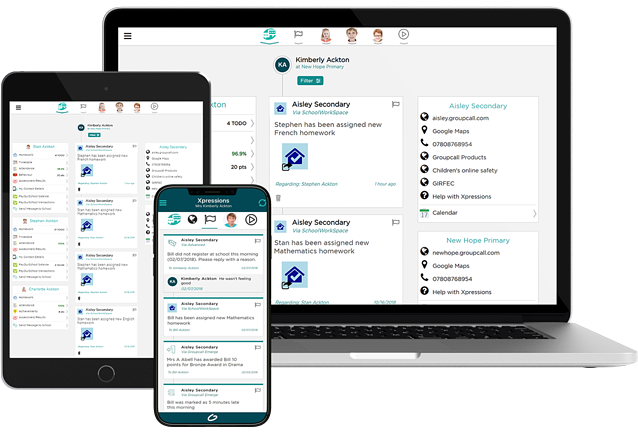 Xpressions is an amazing tool for parents – a one-stop-shop communication tool to provide them with everything they need in terms of progress updates, performance and achievement of their children in their hands or on their desktop. But do your parents know about Xpressions? Are they downloading and using it? Have you got the message out? 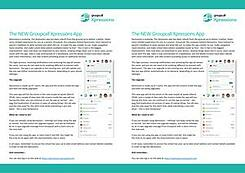 We’ve provided some tips below to help you get your parents using Xpressions. It sounds obvious, but they need to know there is a free app for them in the iOS and Android stores. 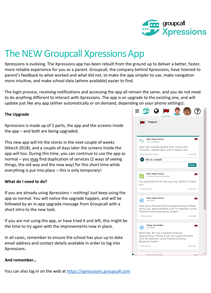 Alternatively, parents can also log into Xpressions by visiting xpressions.groupcall.com. 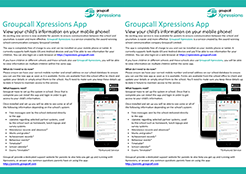 Parents just need to search for Groupcall Xpressions from their app store to download the app. 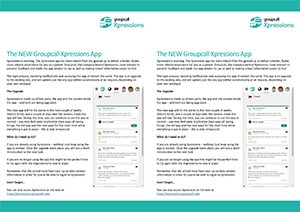 Parents can also visit xpressions.groupcall.com to view their account from an internet browser. Again, sounds obvious but often parents are only told ‘download this app and you’ll get free messages from us’. Tell them the benefits of having Xpressions! Xpressions shows a timeline of messages/message history from the school and any connected school systems. Parents will get notifications of new messages if they download the app (they need to stay logged in for this). Parents can also send you messages from their Xpressions, e.g. to tell you if their child is ill, or they would like an appointment with a teacher. 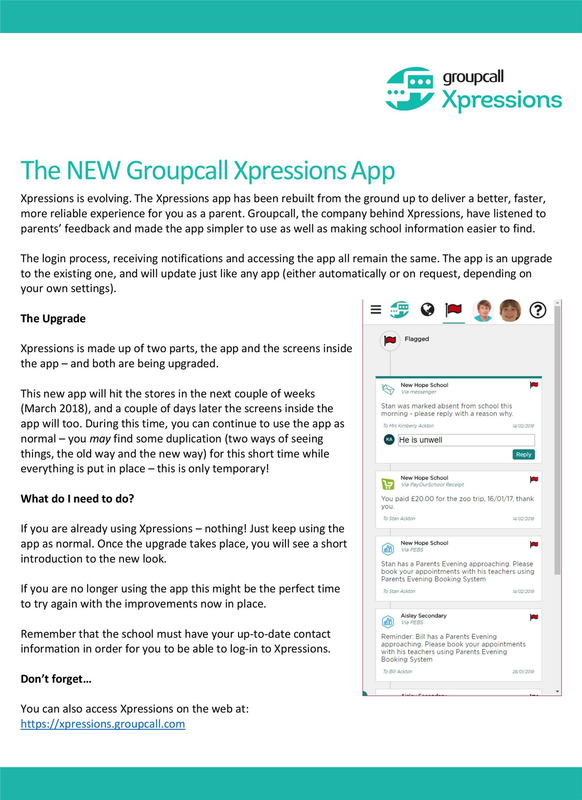 Parents can visit a dedicated website to support them with using Xpressions. From here, they can find out how to get logged in, use the app and view the FAQs. They’ll also have access to support guides to help them resolve common issues, e.g. having trouble logging in. If they need to, parents can also get in touch with Groupcall Support. Most apps need a username and password to log in, especially where personal information is displayed. Xpressions makes this process very easy, by using common information already available to both you and parents: their email address and mobile number. Let parents know that they will need to use the email and mobile number that you have stored for them in your MIS. Support this by making sure their email addresses and mobile numbers are up to date in your MIS! 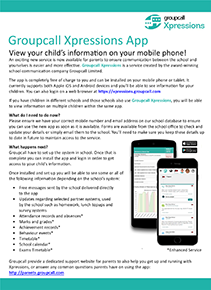 Parents can use Xpressions top up cashless catering lunch money (with a compatible system and using PayOurSchool). 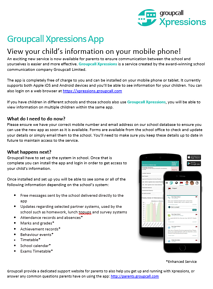 Parents can see a record of their child’s attendance, behaviour, achievement and assessment (with the Enhanced Xpressions subscription, with a compatible MIS) from their Xpressions account. There are many ways you can help to draw parents’ attention to Xpressions. 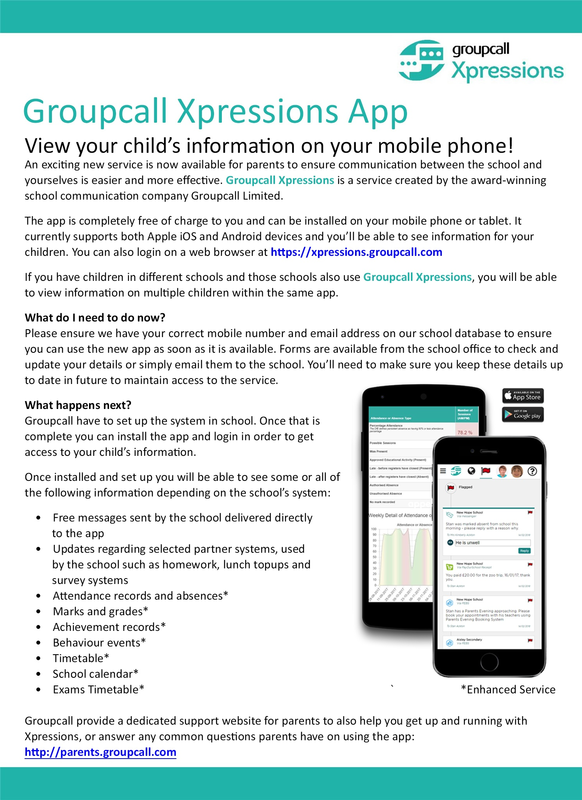 Individual schools will know the best way to get information home to parents, but we’ve set out some tried and tested methods to help you. 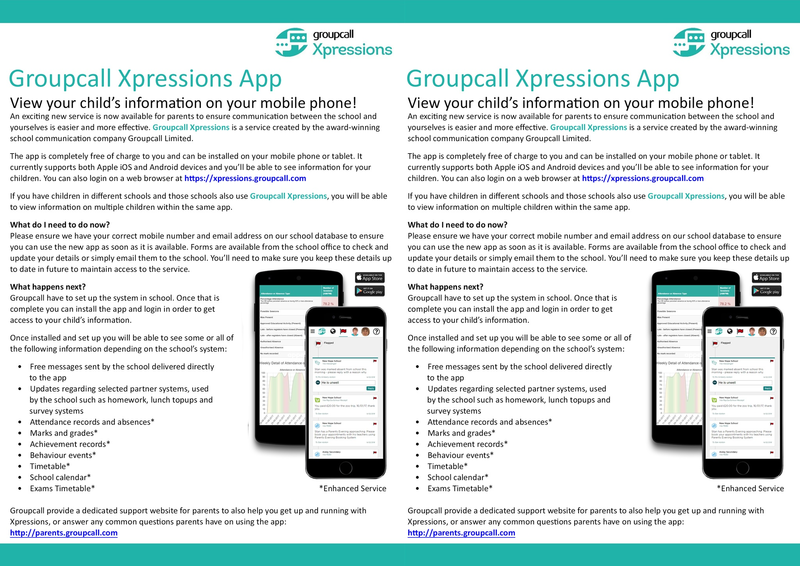 Schools that are now using Xpressions successfully found that presenting/introducing Xpressions at Parents’ Evening or similar events received a positive uptake. Parents’ Evening is also a great forum for any common questions to be answered, which will help to increase parents’ confidence. Many schools tell their parents about Xpressions by sending letters or emails home, creating videos or posting on their social media. Even just putting reminder on the bottom of emails you are already sending from Messenger will help let parents know! 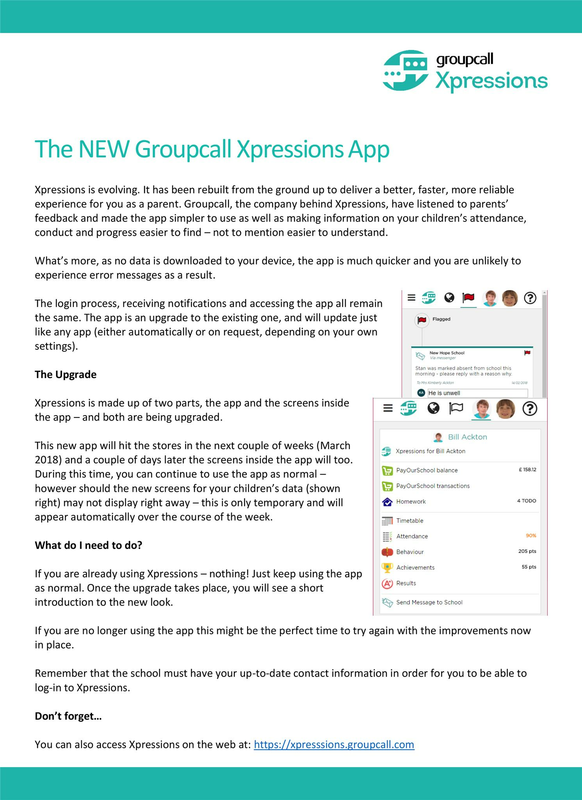 Parents get a lot of information sent home on a regular basis, so introducing Xpressions won’t always sink in the first time. 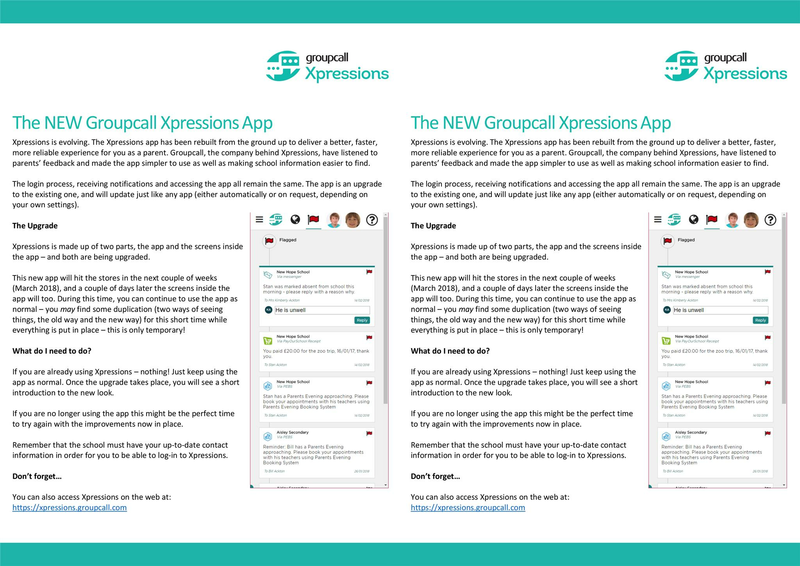 Keep reminding parents to use their Xpressions, explaining how it saves your school money which can then go back into teaching and learning. Remind them that they can visit the dedicated parent support website for Xpressions by visiting parents.groupcall.com. Parent letter: We have provided the PDF flyer as a word document to customise as required. You can also copy and paste the text to send to parents via email. Parent Flyer (x2) A5: Print the PDF flyer 2 per page to save paper. The A5 can be displayed copies around school and/or send home with students to give to parents. 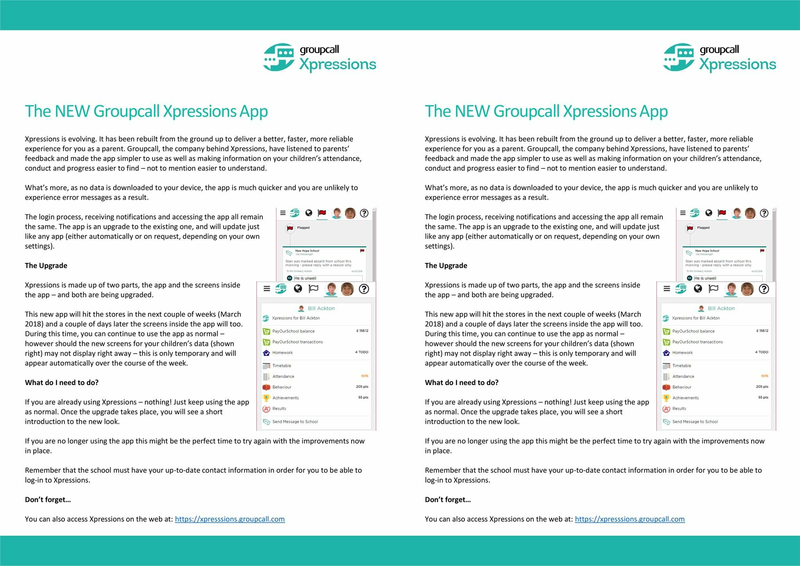 Use any of the below resources to provide parents with everything they’ll need to know to help them get started with Xpressions. Just click on the resource to download it. Use this as an attachment to an email notifying parents about Xpressions. You could also print this and put it on notice boards around school. Print the PDF flyer 2 per page to save paper. The A5 can be displayed copies around school and/or send home with students to give to parents. We have provided the PDF flyer as a word document to customise as required. You can also copy and paste the text to send to parents via email.